Summary: In between highbrow and lowbrow, there’s Unabrow. Seriously, how could I resist the cover of UNABROW: MISADVENTURES OF A LATE BLOOMER? Isn't it hilarious? 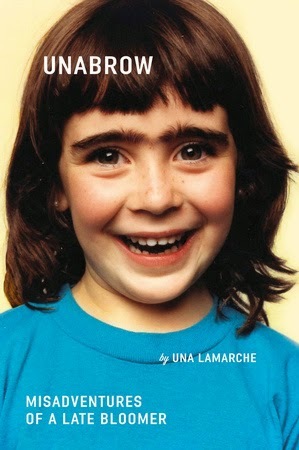 UNABROW is a memoir written by young adult author Una LaMarche; and as you can tell by the cover and the title, Ms. LaMarche had a pretty major "unabrow" as a child. Her very funny, yet insightful, book goes to show that what doesn't kill you makes you stronger! UNABROW is one heck of a funny memoir, and it was so entertaining that I read it in one sitting! I found myself laughing out load quite a bit because Ms. LaMarche certainly has a way with words. She manages to make almost every situation funny, while at the same time showing a keen understanding of growing up female in America. I truly believe most women will not only howl at her stories, but nod their heads in agreement! I knew from the start that UNABROW was going to be an interesting read! It begins when Ms. LaMarche discusses an agreement she and her sister have. If Ms. LaMarche ever ends up in a coma, her sister Zoe has to pluck her eyebrows! Of course, she wouldn't mind having her brush her hair and read her the tabloids too, but the eyebrow plucking is an absolutely must! Needless to say, the author's way with words makes this story absolutely hysterical, but you get the drift! Ms. LaMarche tells some pretty cute stories from her childhood and her teen years; however, she also gives some wonderful advice about being a mother. Sometimes this "wisdom" might cause you to shake your head, but I also suspect it will make you laugh out loud. I found I could definitely relate to both her awkward teen years (but what woman can't relate to that?) and how much her life changed when she became a mother. UNABROW was first and foremost an entertaining collection of essays based on the author's popular blog, The Sassy Curmudgeon. However, there were also a few spots in these stories that did make me reflect a bit... or at least remember my childhood, teen years, or even early motherhood. Overall, I'd have to say that this book was definitely more fun that substance, but don't be surprised if you start fondly (or not so fondly) remembering what it was like growing up female in America! UNABROW is an extremely fun (and funny) read. Highly recommended to fans of Tina Fey's and Jen Lancaster's books. I love that cover and bet I'd love the book too! I really have got to stop reading book blogs. My "to read" shelf on Goodreads it ridiculously large! LOL But this one sounds like super fun.